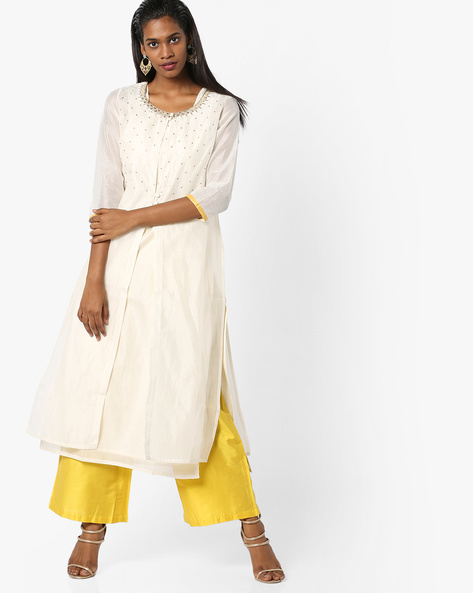 Call me weird, but, if you give me any amount of money for shopping, I’d end up with cotton/linen/ handloom salwar suits or kurtis rather than a swanky embellished dress. Well, I’ve come to realize I am not alone and it’s all coming back in a full circle. Cotton suits are classy, sophisticated, and the obvious choice for some women who prefer comfort over fashion. The best part about the cotton salwar is you just need to get a few details right and – BAM! You are sorted. If you haven’t already guessed, neck and sleeves designs are those crucial bits. And, yes, we will chalk out some churidar neck designs from the latest catalogs to make the job easier for you. I’m sure we all have one of these Angrakha style dresses in our ethnic closets. 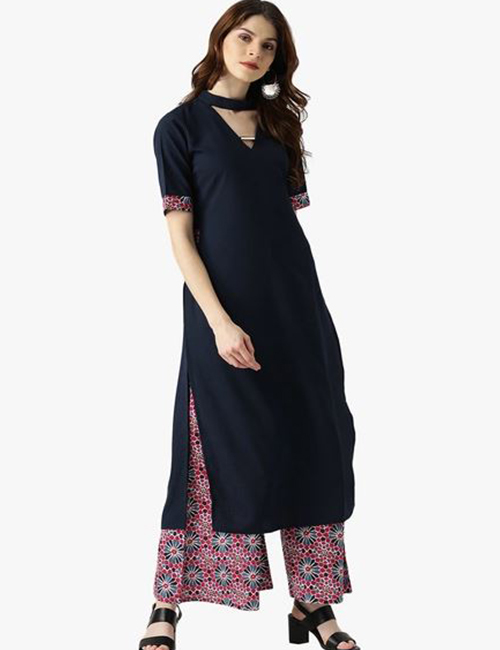 If your dress material is of black linen, indigo or warli art, you should consider getting this broad V-neck design that sweeps to the side. Get piping for the neck and let it form a side knot. It adds definition to your outfits and sits well on you. Chinese collar is one sure shot way of sprucing up your cotton suit. 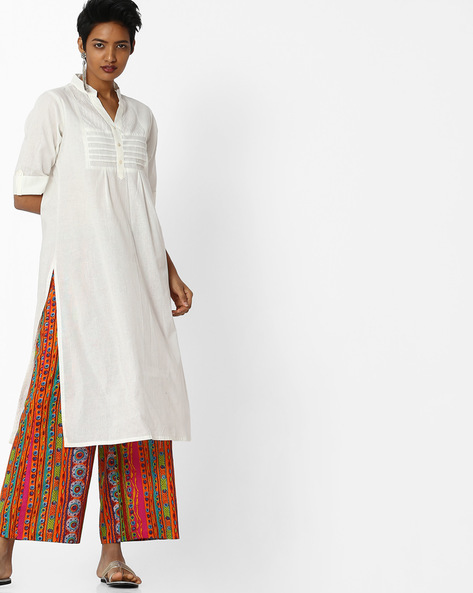 Yes, take one good look at this kurta, and you will realize that there is just one detail that lights the whole thing up. Plus, this is a hot favorite among women who like smart dressing, because it makes you look elegant and sophisticated. A plain white or black cotton dress with palazzo pants, an updo, and silver jewelry are all you need to look uber classy. High necks are one of those retro trends that are making a comeback, so if you have always been the kind who likes high necks instead of deep ones, you’d be happy to know that you can get them by the dozen now! You can go heavy or light with the embroidery pattern depending on the material. Chanderi cotton, silk cotton, etc. are expensive variants and make for exciting party wear options. Go with a scoop neckline and embellish it with mirror work. The mirrors add to the style of the fabric and lift it all up further. 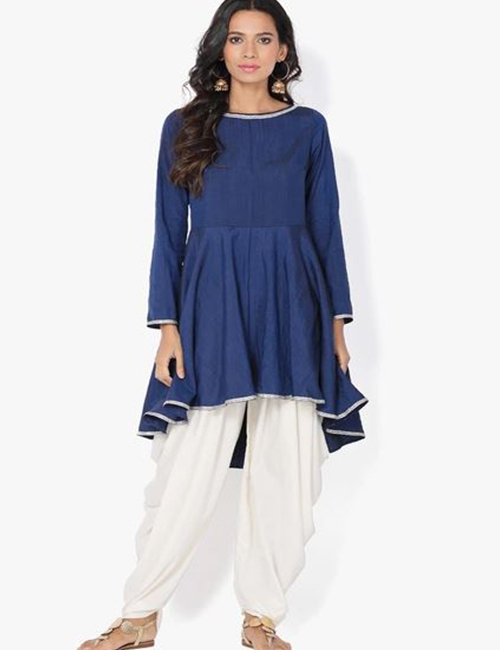 By now, we know that one piece shirt dresses are coming back, and so are kurta and Patiala sets in this style. 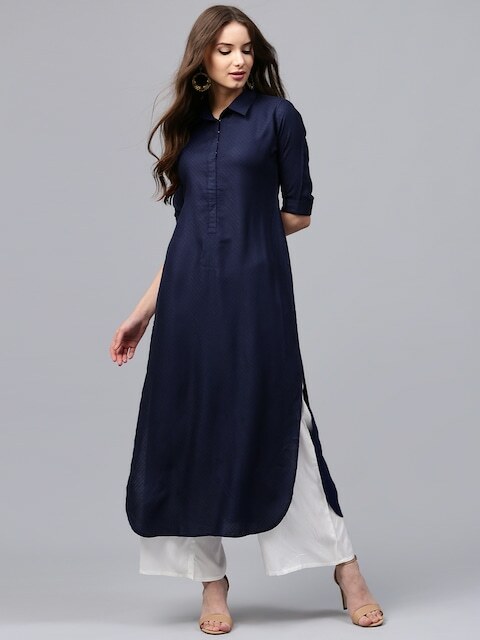 A plain collar style short kurta with cowl or Patiala pants; or long collar kurtis with palazzo or cigarette pants look super chic. Throw on some pumps, style your hair in beachy waves, put on smokey eye makeup – and you are sorted! 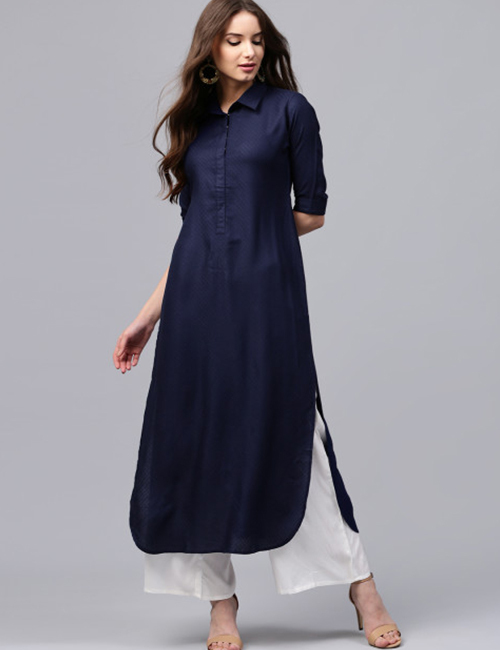 A-line style kurta and Mandarin collar is an interesting combination. 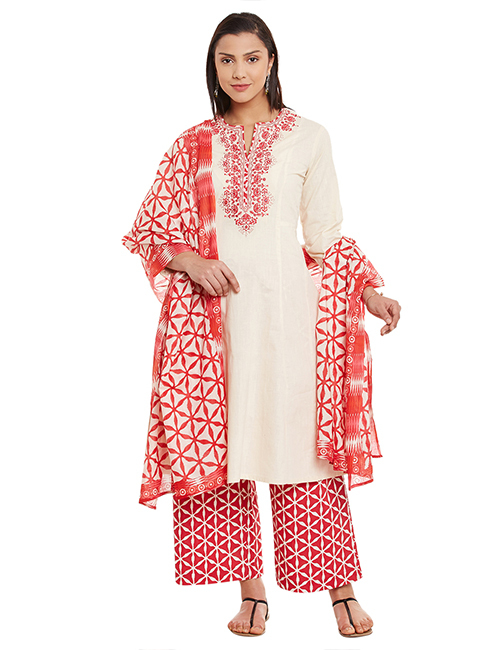 Again, this looks nice with silk or chanderi mixed cotton dresses. Go for a buttoned enclosure just like this one and let those little details take over. Go for contrast colors for the collar and whatever embroidery you like. The choker is probably the biggest 90s trends to have made a comeback and fashionistas all over the world atr more than happy to have them back. And, so are our ethnic labels. Who would have thought that a choker style collar will go with an Indian kurta or salwar – well, here you go! 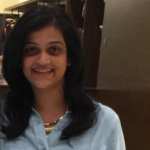 Skip the dupatta and neck accessories, and bank on your earrings. 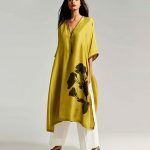 More and more women are choosing complete round necks for sarees and dresses because – one, it looks polished and neat; two, it helps to pull off the whole bare neck and chunky earrings style. So, round neck with 3/4th sleeves should be your go-to attire if this style defines you. 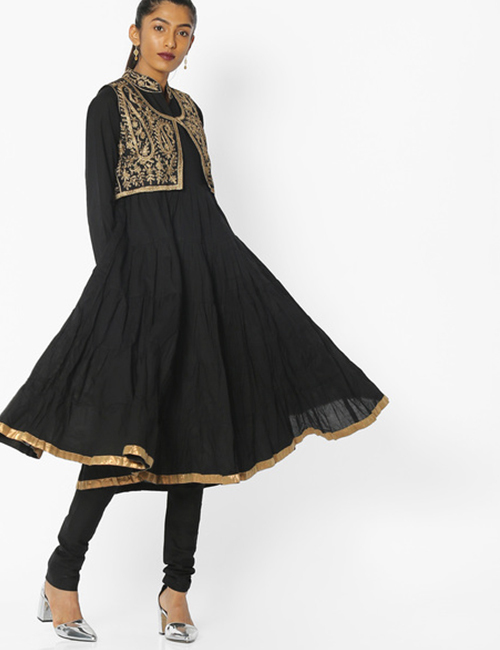 A lot of designers prefer this embroidered Chinese collar for Anarkali dresses because nothing marries the style and the look like this one does. So, for smaller functions, lunch parties or for festivals that need to be ornate, go for this neck design. 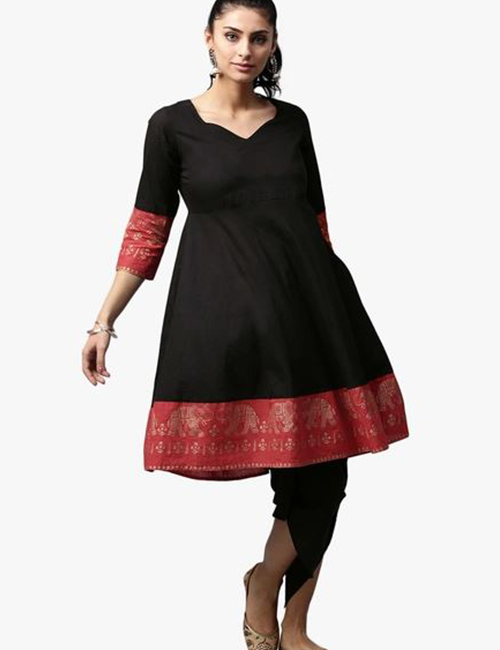 Broad and deep, the half diamond neck is another chic neck design for your handloom salwar suits. Sambalpuri, pochampalli, ikkat, etc go well with this neck design. Are you a fan of plunged V-necks, but not very comfortable with the idea of actually wearing them? No problem. Go with this broad plunge V-neck line and add a patch to camouflage the chest. Go for a similar colored patch and contrast colors for the embroidery, or standard shades like dull gold or silver to amp up your outfit. 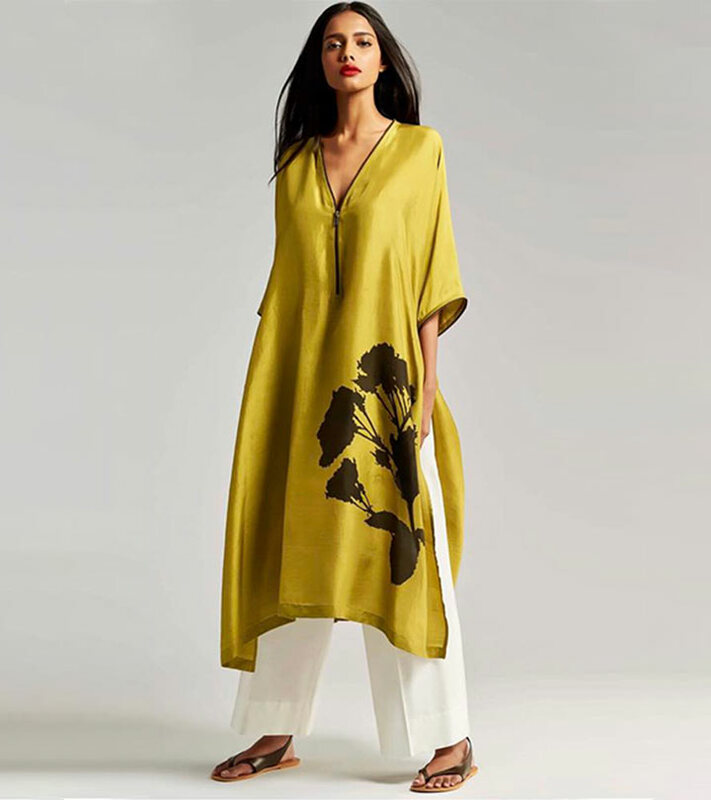 A neck that is in-built in most salwar suit materials; so, it’s not new to us. But, it never goes out of style – go for a simple V and get threadwork, maggam or embroidery done. You hardly need any accessories; the dress will do all the talking. We can never get enough of boat necks for our blouses and dresses, can we? I cannot, and I think they look ravishing. And since everything stands out when it comes to cotton, z boat neck will look great as it is or with piping/embroidery, etc. How about bringing our two most loved neck designs together? Well, thanks to our designers, it’s possible now. Collar neck with plunge V-neckline – without the buttons, mind you! Don’t be shy, give it a shot. Plain round necks will never fail you, but can sometimes be quite bland, especially when it comes to cotton dresses. So, add a little zing to it by adding a little something to the bodice that looks like an extension of your churidar neck design. Simple to the eye and sophisticated to wear – that just describes cotton dresses best. Are you considering switching to cotton or want more of them in your closet? Or, have you always been a cotton-churidar kind of a person? Which one of these churidar neck designs is your favorite kind? Let us know by dropping in a text in the comments section below.